Last year I started what I suspect will become a bit of a tradition. I named my 5 favourite new songs of 2007. I was loose in my definition of new. This year, ‘new’ means new: all but one of the songs was published in 2008. So here you go: my top five new songs of 2008. 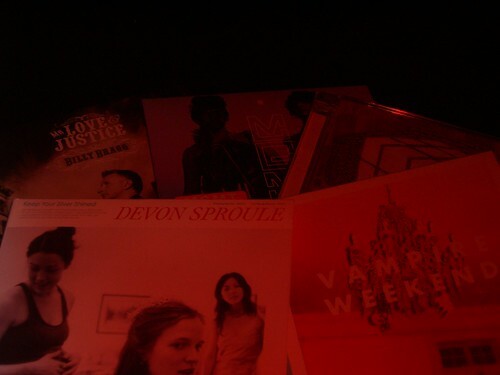 I fell in love with Vampire Weekend, the Kings of PrepPop, back in January when I saw them live in Hoxton. Barely weeks later, their first album was released and it’s a corker. For my money, their best song is Oxford Comma. I find it hard to resist a song about punctuation and this video is pure dead brilliant. VW are my band of 2008. But I’m looking for a new mistress in 2009. Earlier in the year, when the girl who dumped me in 2007 was fresher in my memory than now, this song spoke to my dwindling heartbreak. Comrade Bragg is a towering genius and this is a bittersweet, almost cruel, lovesong. The video is a good live version (and the best I can find) but the album version (and the album in general) is more soulful. And a little less political than his previous stuff. Catharsis is a word overused by people who’ve never experienced it. The first time I heard this song, I welled up and cried. I was sat in the garden on a warm spring evening drinking beer and I felt much better. It’s been overplayed on Radio 2. But it is brilliant and they did win that prize, after all. Anthemic. Orchestral. Majestic. Optimistic. Enough man-angst already. This is a beautiful ditty from the delicious songster Devon Sproule. Just one of many superb songs from a brilliantly jaunty album that quite simply makes me happy. Technically, 2007. Apologies. The album is much more jazzy than this solo acoustic version and so worth your time. Meaningless electronic pop. I love the lyrics. I love the sound. I don’t love the fact that a proper embeddable video can’t be found on Youtube. So make do with this link to the official video. Vampire Weekend: the end of the affair.